VetStem Biopharma is Happy to Announce Several of its Veterinary Clients have Surpassed the Centennial Mark by Performing VetStem Cell Therapy on over 100 Patients. The leading Regenerative Veterinary Medicine Company, VetStem Biopharma, is proud to announce that 10 of its most experienced veterinary clients have treated over 100 of their own patients with the VetStem Cell Therapy. The leading Regenerative Veterinary Medicine Company, VetStem Biopharma., is proud to announce that 10 of its most experienced veterinary clients have treated over 100 of their own patients with the VetStem Cell Therapy. Each of these veterinarians has embraced this cutting edge technology to provide the highest level of care for their patients. The veterinarians are Dr Ross Rich former owner of Cave Creek Equine Surgical Center- Phoenix, AZ now with Regenerative Medicine Consulting, Dr Martin Gardner of Western Performance Equine Ione, CA, Dr John McCarroll of Equine Medical Associates Pilot Point, TX, Dr Bill Hay of Tryon Equine Hospital Columbus, NC, Dr Scott Reiners of Mountain View Equine Hospital Steels Tavern, VA, Dr Kim Carlson of VCA Bay Area Veterinary Specialty San Leandro, CA, Dr Adam Gassel of Southern California Vet Specialty Hospital Irvine, CA, Dr Keith of Clement Burnt Hills Veterinary Hospital Burnt Hills, NY, Dr Jamie Gaynor of Peak Performance Veterinary Group Frisco, CO, and Dr Tim McCarthy of Cascade Veterinary Referral Center Tigard, OR. 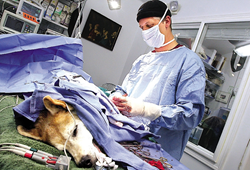 Several of these veterinarians have also presented their VetStem Cell Therapy patient outcomes at major veterinary conferences throughout the United States. Stem cells are regenerative cells that can differentiate into many tissue types as well as being able to reduce pain and inflammation thus helping to restore range of motion and stimulate regeneration of tendon, ligament and joint tissues (http://www.vet-stem.com/science.php). In a study using VetStem Regenerative Cell Therapy on dogs with osteoarthritis of the hip joint it was found that regenerative cell therapy (adipose-derived stem cells) decreases patient discomfort and increases patient functional ability. VetStem Cell Therapy also demonstrated that the use of cell therapy promoted a better quality of healing for tendon and ligament injuries in horse with over 75% of horses treated returning to their prior performance level. Once each of these veterinarians has identified a patient as a good candidate for stem cell therapy the procedure begins with a fatty tissue collection from the patient. The tissue sample is sent overnight to VetStem’s lab in California for processing. Once processed the stem cells are quality checked and then injectable doses of the patient’s stem cells are sent overnight, back to the veterinarian. Within 48hrs of collecting a fat sample from a patient they are able to inject stem cells into (arthritic or injured) affected areas and healing can begin. VetStem would like to thank each of these veterinarians for their dedication and hard work in providing the highest level of care for their patients. We value our relationship with each veterinarian and are proud to be able to help them serve the animal community. We continue to strive to provide the highest quality services to our veterinary partners in order to provide the highest level of veterinary care. We know the human animal bond is an important part of our world today and strive to provide therapies that will give animals’ longer and better quality lives. VetStem Biopharma is a veterinarian-lead company that was formed in 2002 to bring regenerative medicine to the profession. This privately held biopharmaceutical enterprise, based near San Diego (California), currently offers veterinarians an autologous stem cell processing service (from patients’ own fat tissue) among other regenerative modalities. With a unique expertise acquired over the past 14 years and 12,000 patients treated by veterinarians for joint, tendon or ligament issues, VetStem has made regenerative medicine applications a therapeutic reality beyond the realm of research. The VetStem team is focused on developing new clinically practical and affordable veterinary solutions that leverage the natural restorative abilities present in all living creatures. The company’s stated mission being “to extend and enhance the lives of animals by improving the quality of recovery in acute conditions, but also by unlocking ways to slow, stop and ultimately revert the course of chronic diseases”. In addition to its’ own portfolio of patents, VetStem holds exclusive global veterinary licenses to a portfolio of over 55 issued patents in the field of regenerative medicine.